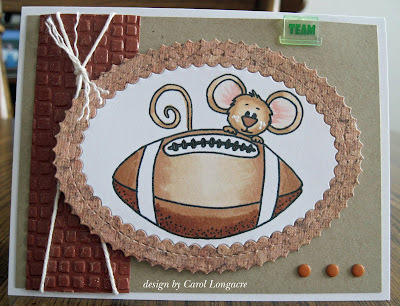 I had to make another card with my favorite mouse Cocoa from Sweet 'n Sassy, and this time he's with his football. I colored the image with Copics, and die cut it with some Gina Marie Designs dies and an old piece of dsp that looks like cork. I embossed a piece of cocoa-colored cardstock with a CB ef, then covered it with Versamark and clear ep and heat set it - making it resemble the texture of a football. I added some neutral twine, a few SU! candy dots and a little clip at the top that says TEAM. It's a just for fun card as the new football season starts getting under way. I'm sharing this with the 2 Crafty Critter Crazies challenge #17 - which is a/g but you must use a critter. Thanks for checking in and I wish you a good day! Very cute football image. Your mosaic embossing folder does resemble the texture of a football! Great idea! Yes, It is soon going to be that time again. Wonder if it will be as exciting as last year? Can you tell that I'm an Eagles fan? Your card is really cute (especially Cocoa...what's not to like?) Great card to start the season. How fun football card!!! Full of textures and so cute too! :) Love the little clip and the string, such interesting details! A perfect card for a male, surely!! A fun card Carol, such a cute little mouse and great design. Such a cute image and a fun card design. Great job coloring too. A super cute card. I had no idea that Cocoa played football. He is full of surprises. I love this feetball image of Cocoa! Great choice of EF for the side border. There's little Cocoa once again - and still looking sharp! Sensational coloring on that image Carol!!!! Great design and a perfect card. Oh, and glad you're playing in 2 Crafty Critter Crazies challenge too! Oh another Cocoa card!! I really need to get out my Cocoa stamps or print out some of the digi ones I have! Love the monochromatic color scheme you used for this one.